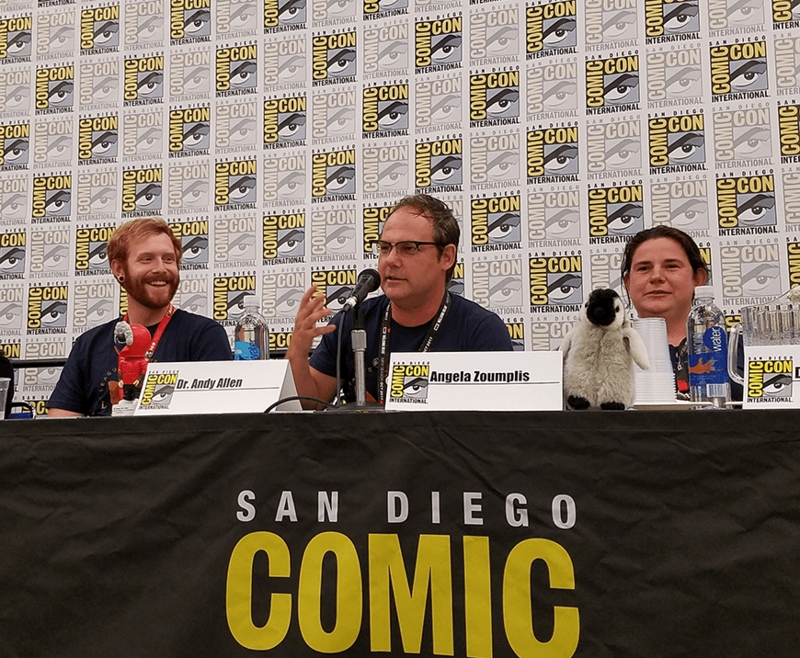 Scientific accuracy usually isn't the focus of a venue more used to tales of costumed heroes, supernatural creatures, and galactic struggles, but researchers from Scripps Institution of Oceanography at the University of California San Diego suited up for San Diego Comic-Con last weekend. Joining the League of Extraordinary Scientists and Engineers science communicators for Sunday’s panel on putting "More Science in Your Fiction" were, from left, Ben Frable, collection manager for the Marine Vertebrates Collection; associate professor Andrew Allen, who studies environmental and microbial genomics with the J. Craig Venter Institute (JCVI); and marine biology graduate student Angela Zoumplis, who works in Allen’s lab. Panelists took questions from an audience of about 200 people on topics such as the best and worst science they've seen in popular culture to how their fields would be affected by global warming to, for Frable, what were his favorite fishes and the collection's weirdest specimens. Once answer: the stargazer, a marine fish with eye muscles that have evolved to transmit electric shocks. Also on the panel from UC San Diego were Nick Galitzki, cosmologist and postdoctoral scholar at the Center for Astrophysics and Space Sciences and Lisa Zeigler Allen, an assistant professor in the Microbial and Environmental Genomics Department at the Venter Institute and a visiting scholar at Scripps's Integrative Oceanography Division.